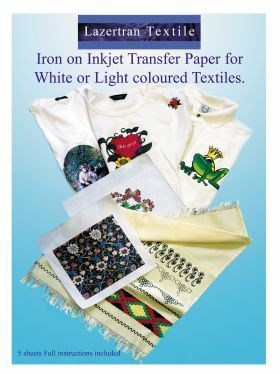 Lazertran Inkjet Textile Iron on Transfer paper for white fabric, Ideal way to make your own and textiles and t-shirts. Instruction for using Lazertran Inkjet Textile Iron on Transfer paper for White cloth. This special paper allows you to transfer images using your computer inkjet printer. It must not be used with Laser printers. Print in mirror image mode onto the white side of the transfer paper. Transfer paper mode (if available) if not normal paper using best quality. We recommend allowing the printout to dry for about 30 minutes before continuing to apply to fabric. Do not worry that the image may appear a little pale, as the colours will be restored to their original brightness after application. 1. Switch your iron high and pre-heat. Place the transfer paper with the image side down onto the fabric, which must be wrinkle free and pre-ironed. 2. Place a smooth cloth, for example, 2 or 3 kitchen towels or a folded pillowcase between the fabric and a flat solid surface such as a tabletop. 3.Iron the image onto the fabric by applying consistent circular pressure distributing the heat evenly. 4.Concentrate on using the center of the iron during transfer, paying particular attention to the edges of the image. Do not use steam. Heat for 60-90 seconds for small images and 90-120 seconds for larger images. 5. Let the transfer paper cool then peel off the backing paper from one corner using steady firm and pressure. If the image starts to pull away from the cloth iron a little more or increase the iron’s temperature. finished applying all the images. A heat press can also be used. Set the temperature to 160 degrees C and press for approx 40 seconds. Wash at max 40 degrees C turning the garment inside out. Do not bleach and do not tumble dry. Protect the image with kitchen parchment paper when ironing.